· A great location just a stones throw from the sea and still within easy walking distance to all the local shops and bars. 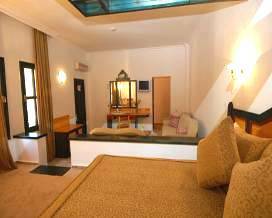 · The rooms are large and decorated to a high standard, each having en-suite facilities, air conditioning, TV and balcony / terrace. Tucked away right at the end of Olu Deniz beach, surrounded by lush fruit gardens, olive groves and pine forest is Olu Deniz Resort Hotel. Another popular choice with families, it offers a good choice of activities including windsurfing, pedaloes, tennis and billiards, alongside having large indoor and outdoor pools and a separate children's area. There is a Turkish bath, TV lounge, meeting room, Sauna, Jacuzzi and gymnasium so you should never find yourself bored! The 170 rooms are well designed in low level blocks around the main communal area. Each has air conditioning, TV, hairdryer, en-suite shower room and a terrace or balcony. The hotel has a good restaurant serving varied buffet menus at breakfast, lunch and dinner and three bars to choose from. Due to it’s popularity in high season it is advised to book well in advance to avoid disappointment. PRICES QUOTED ARE ON AN ALL INCLUSIVE BASIS PER PERSON SHARING A DOUBLE OR TWIN ROOM PER NIGHT. Rooms sleeps upto three adults or two adults and two children in twin or double beds, individually controlled air conditioning, satellite TV (plasma), direct dial telephone, hairdryer, full bathroom, safety deposit box, full minibar, kettle, tea and coffee, carpet or wooden floor and balcony or terrace. Some rooms with sea view. PRICES INCLUDE: Buffet breakfast, lunch, snacks and dinner and unlimited soft and local drinks (10am—2am) There is a happy hour for cocktails. NB: There is a small charge for reservation at the Al La Carte restaurant. LOCATION: On the beach. 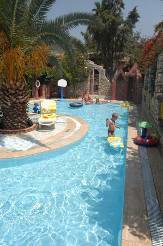 5 minutes drive from Olu Deniz, 15 minutes from Hisaronu. Located in its own bay at the foot of Babadag Mountain.